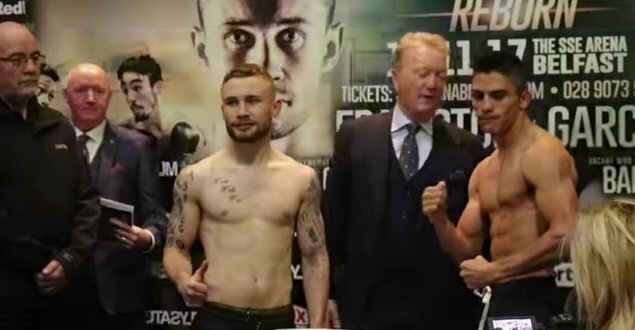 Former 2 division world champion Carl Frampton made weight on Friday for his stay busy fight against Mexican fighter Horatio Garcia for their match this Saturday night at the SSE Arena in Belfast, Northern Ireland. Frampton, 30, weighed in at 127 pounds. His little known opponent, 27-year-old Garcia, weighed in at 127 lbs. as well. Frampton vs. Garcia will be televised on BoxNation in the UK. This is the first fight for Frampton since his loss to Leo Santa Cruz. Frampton is taking an easier opponent than he normally would due to him being out of the ring since last January. IBF super flyweight champion Jerwin Ancajas weighed in at 115 lbs. for his title defense against #4 IBF Jamie Conlan. For his part, Conlan also weighed in at 115 lbs. This fight figures to be a blowout with Ancajas tearing Conlan apart fairly early. Conlan had a lot of spirit outside of the ring, but he’a no match for Ancajas. WBO bantamweight chmapion Zolani Tete weighted in at 117.5 for his title defense against Siboniso Gonya. The challenger weighed in at 116 lbs.